The CRAFT: Babka and Beyond public collection features 28 interviews conducted with people connected to the production and use of grain within the Rivers of Steel National Heritage Area in Western Pennsylvania. The stories feature bakers, bakery owners, farmers, and even a Benedictine Monk talking about how grains contribute to larger themes of identity, community, and social capital — whether in agriculture, bread making, or baking. As part of the Babka project, the CRAFT team held a 75-seat storytelling dinner in July 2018 featuring a multi-course menu by chefs Mike Costello and Amy Dawson of Lost Creek Farm inspired by the stories of the participants. Each course was paired with a live storytelling performance from the project contributors, and attendees included community members as well as project participants. CRAFT: Babka and Beyond is the first digital collection to come out of Chatham University’s new Center for Regional Agriculture, Food, and Transformation (CRAFT). The oral histories, which range from 10 minutes to an hour, are managed and cataloged using JSTOR Forum and published as an Artstor public collection, freely accessible to all. 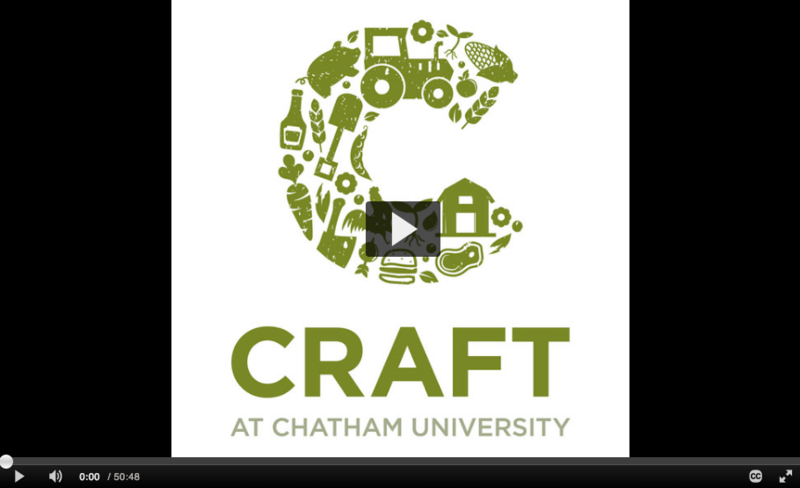 CRAFT is affiliated with Chatham University’s Food Studies program and the Falk School of Sustainability. Its mission is to serve as a home for food systems information and data at the regional level, creating a network for research, education, and outreach on sustainable food. As part of this mission, CRAFT provides resources, learning opportunities, and technical assistance on food systems, regional food cultures, and sustainable economies in Western Pennsylvania. Included in this mission is a mandate to document and preserve the stories of people and businesses connected to local food systems through the Western Pennsylvania Foodways Collection (WPFC). The WPFC seeks to gather, house, and share oral histories and contextual material such as interviews, recipes, images, and text as a way of documenting agriculture and food stories in the region. There are two other projects on the horizon for the WPFC: One, called “From Noodles to Naan” focuses on ethnic communities using grains in the Pittsburgh area that were not covered by the initial Babka and Beyond project. The second, called “Italian-American Foodways,” will explore the Italian-American food experience in the Pittsburgh neighborhood of Bloomfield. The stories and material collected during these projects will also be shared publicly on Artstor. By making these projects available as public collections on Artstor, the CRAFT team hopes to grow the audience for these unique resources as well as to pair qualitative sources with the more traditional quantitative data they collect (such as an upcoming project with the state of Pennsylvania to perform a 200-mile food inventory). The research center serves as a hub for data sets that are relevant to regional food systems and, in conjunction with the WPFC and their community programming efforts CRAFT has become a gathering point for the community they support and document.